In the case that a Japanese gets married to a non-Japanese outside Japan and changes his/her family name, the new family name should be shown on his/her passport. In my case, I added my husband's family name after mine, so I needed to get a stamp stating that my name had been amended on my passport. 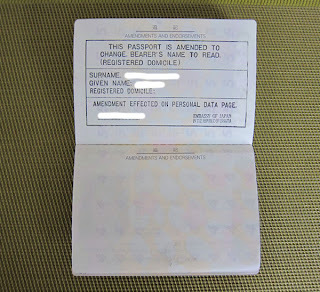 In Japan, we allow to have only one family name, so when I added my husband's name, I didn't have to change the front page of the passport, but just needed a note stating that my name outside Japan had been amended. 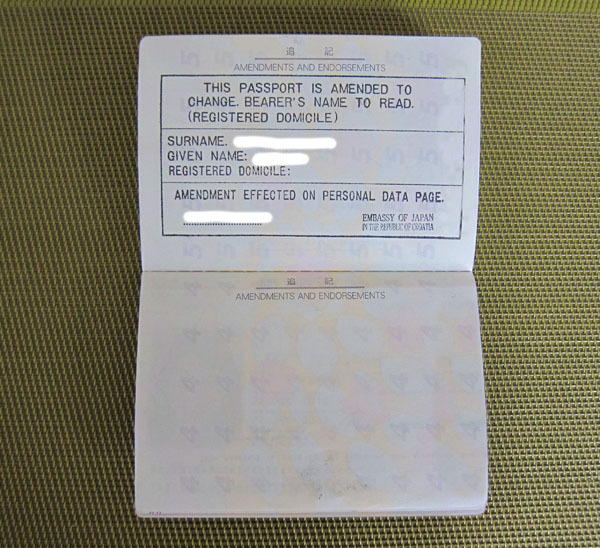 To amend the name on the passport for the Japanese, we need to bring a family register (a new one), in which the marriage is registered, and a copy of a document in which a spouse's name is stated (such as a copy of a passport, a copy of Domovnica), and of course, the passport to the Japanese Embassy. At the embassy, I needed to fill 2 requests for name amendments and pay 50 Kn, that's it. The amendment may be done on the same day, or at least by the following day. To obtain the new family register, in which the marriage is registered, you need as your family in Japan to go to the local government office to check if the marriage is registered and if yes, get a copy and send back to you. Usually, it takes about a month until the marriage is registered after filing the marriage registration at the Japanese Embassy. In Croatia, you won't be able to obtain the temporary residence permit unless you amend your name on your passport, if you changed your name upon marriage. So, better to amend your name on the passport while the procedure for the temporary residence permit is in process and before you obtain the permit. In my case, because I delayed filing of the marriage registration with the Japanese Embassy, I had to wait until my name on the passport was amended even though the temporary residence permit was granted.